It's the best leather coat you will ever own. It's your skin. And smooth or wrinkled, it tells the story of your life. Take a photo that features skin as its subject. It can be an abstract detail shot or a larger portrait. Your call. In the simplest terms, if you want to flatten wrinkles, you line your light source up head-on. If you want to bring out wrinkles, make sure your light comes in from the side. To bring out optimal textures, you need to consider your light. Read more on that here. Now, to exaggerate the wrinkles/bumps/hairs/texture that you've photographed, you'll want to pump your contrast. But there's an art to it to make the effect feel natural. Read more on that here. Our lead image is from flickr's linh.ngan (cropped here). Note that you won't be able to get a photo like this at noon in full sun—her face would be washed out. If photographing outside, do so in the morning or near dusk. 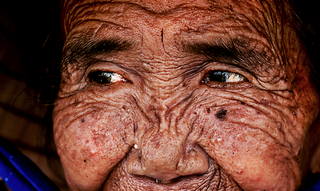 Send your best photo by Monday, May 19th at 9AM Eastern to contests@gizmodo.com with "Skin" in the subject line. Save your files as JPGs, and use a FirstnameLastnameSkin.jpg (970px wide) and FirstnameLastnameSkinWallpaper.jpg (2560px wide) naming conventions.